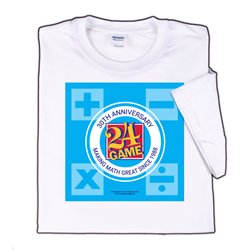 Full-color T-shirts celebrate the 30TH ANNIVERSARY of the 24® Game, and feature the 24 Game logo. Back of shirt is blank. Available in adult sizes. White shirts are 100% cotton and printed in USA. Available in Adult small, medium & large.